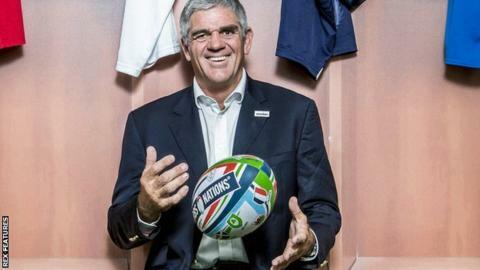 The Rugby Football Union has denied former South Africa coach Nick Mallett's claim he was sounded out for the England head coach job this week. Mallett was one of the candidates who lost out when current England coach Stuart Lancaster was appointed in 2012. An RFU spokesperson said any decision on the job would follow a review of the World Cup, adding: "No pre-judgements have been made nor anyone contacted." Mallett said he would not consider the England job this time around. "I was keen for the challenge in 2011, but not any more. I'm enjoying my current job," said the 58-year-old, who is now working as television pundit. Lancaster, whose position is under scrutiny after England's failure to make it out of the World Cup pool stages, reacted with surprise when informed of Mallett's claim. "I didn't know that to be honest," he said. "I guess that is just the nature of the situation we are in." Mallett led the Springboks between 1997 and 2000, guiding them to a record-equalling 17 successive Test wins and a Tri Nations title. He was also linked with the England job in the wake of Andy Robinson's departure in 2006, but instead reappeared on the international stage with Italy in 2008, with whom he stayed for three years. England's World Cup campaign concludes on Saturday against Uruguay in Manchester after defeats against Wales and Australia meant they became the first host nation to fail to make the knock-out stages in the tournament's history.